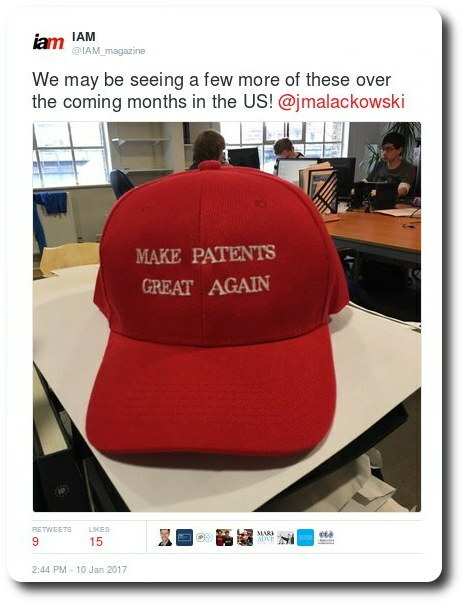 THE USPTO has descended or deteriorated into “law firm” mentality. The goal is money and the Director comes from a firm that judges its “success” by number of lawsuits, patents etc. Why was such leadership appointment by Trump? Maybe past business relations, maybe something even more nefarious than this. In order to increase utilization of patents, there seems to be a need for development of such new applications. Actually, Xinova has issued the Request for Application (RFA) to identify new applications for an existing technology of its customer in November 2017. I’m wondering if universities may also need such an service to explore possible applications for their technology seeds. Anyway, it would be necessary to study how to valuate such ideas of new applications and how to reward the inventors, especially when working with outside persons. They don’t care about inventors, let alone rewarding anyone but themselves (with legal bills). A Republican pundit has meanwhile written for Watchtroll about Federal, i.e. taxpayers-funded, work being passed to patent trolls owing to the Bayh-Dole lunacy. Yes, only a few days ago Watchtroll promoted more of this lunacy, merely a few days after we had explained why this is morally wrong. “Much of the research and development done by NASA has broader applications than space and have been used in many everyday commercial products,” Above the Law summarised. This is an example where taxpayers’ money was invested in patenting decent ideas that the general public can use to make life better. Bayh-Dole, however, turned over such patents to trolls. The trolls sue taxpayers using patents acquired at the expense of those taxpayers. Speaking of taxes, there’s a new article titled “New 2019 French Patent/Software box regime” by Bird & Bird (Brent Springael, Laurence Clot and Coralie Crespin). Bird & Bird of Team UPC infamy (the patent trolls’ proponents) are now advocating tax evasion using patenting/accounting tricks. Isn’t that lovely? The AFCP, which was implemented in April 2012 (see “USPTO to Assess After Final Consideration Pilot Program”), modified in May 2013 (see “USPTO News Briefs”), and extended since then provides examiners with a limited amount of non-production time — three hours for utility and reissue applications — to consider responses filed following a final rejection. GrowPath, a software firm born out of the privacy-obsessed legal industry, has developed and now patented a personalized solution that utilizes an owner’s personal photos as the second step in a two-factor authentication process on mobile devices. The new patent (#10,097,538) is the third for GrowPath. The company’s other patents focus on data obfuscation (cyber) and a logic tool which facilitates, among other things, the ability to easily customize algorithms without advanced science or mathematics training. Images capturing Sanchez’s ever-expanding roster of patent tattoos are here and the video is here. They actually tattoo patent numbers, embedding them deep insode their skin. There are photos there, too. How much more insane can it get? This isn’t a US patent; it’s in Canada. Nevertheless, one must bear in mind that the Canadian patent office usually follows the US. Nasdaq is already involved in some court battles with software patents. PTAB might invalidate these. If not PTAB, then maybe the higher court/s. Such litigation activity helps nobody but law firms and days ago we learned that Immervision is suing LG. They issued a press release about it and it certainly seems as though AP had been reduced to pay-to-say of patent trolls or opportunistic parasites when they sue real companies.